St Agatha Resort is one of the cozy club resorts in Bulacan, Guiguinto area. Their list of affordable rates are incomparable plus they also nurse one of the nicest and user-friendly websites for Bulacan, Philippines resorts today. Visiting them online has never been a nice experience, in fact, their pictures from my point of view are all very enticing to potential visitors looking to have fun under the summer heat of the sun in a swimming pool. You can find the full resort details below. Saint Agatha is the only one with a bistro inside called Ambrosio and a hotel pavillion in one. Perfect for wedding venue, they also nurse one of the biggest list of resort amenities as listed below plus add to the spice knowing that there is a wave pool, lap pool for swim racing and kiddie pool for the children. You can also find a conference room and a boutique, a unique experience for the few who are looking to truly enjoy summer and outings or yes, even an event or birthday to celebrate in their venue. Pagoda cottages are simply exceptional too especially when combined with the zipline adventure. Their location is very easy to reach which is just a 30 minute ride from NLEX exit points near Metro Manila. Next time you want to have fun, you can always take a plunge to this resort in Bulacan area anytime. For events, occasions and other types of celebration, please call their hotline below. Wondering how to get to the resort? Here is a map guide you can use for both commute and even if you have your own car or any vehicle to use to travel and get there. You can also visit their official website here - http://www.stagatharesort.com/. 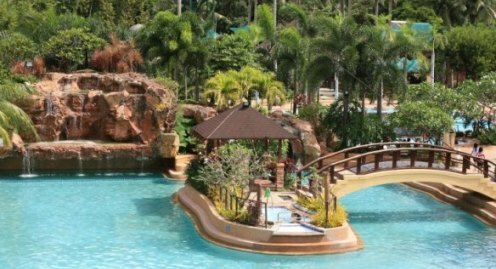 On the other hand, if you are looking for other cheap options, you can always visit our list of the different Guiguinto Resorts or find out about our post regarding free swimming pools in Manila or your choices of Manila resorts and hotels here - https://www.mypilipinas.com/manila-resorts.html.